Tiger Woods will play with Nick Watney and Rickie Fowler this week for the first two rounds at the Farmers Insurance Open. 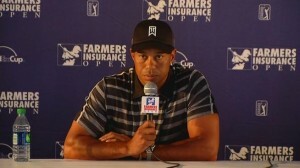 This will be Woods’ first event on the 2013 PGA Tour. The No.2 ranked golfer in the world did play last week at the HSBC Championship, but missed the cut by one shot. He comes to a venue in Torrey Pines though, in which he has won seven times in his career. The most notable win came on the South Course in the 2008 U.S. Open. For the Farmers Insurance Open, play will be conducted on both the North and the South course for the first two days, and then over the weekend will be only on the South, which is the more difficult of the two. Woods’ 2013 debut on Tour is highly anticipated, as it is every season. Fans everywhere are anxious to see what type of game he will bring into the new year. After getting back to his winning ways in 2012, Woods will now try to make that next step forward with a Major championship victory in 2013. He will have several months to get in shape before The Masters in Augusta, which will take place in the second week of April. In between now and then, Woods will play in several big tournaments out West, and then move his way down to the Southeast for the Florida swing. Woods didn’t start getting into a rhythm until the Honda Classic last season, carding a final round 62 to give eventual champion Rory McIlroy a run for his money. McIlroy won’t be in the field this week at the Farmer Insurance Open, but plenty of other will be. This includes Phil Mickelson, Dustin Johnson, Brandt Snedeker, Keegan Bradley, and Hunter Mahan, among others. The key will be making birdies on the holes that you are supposed to. That opportunities will come much more on the North Course than on the South. Players know that they will have to take advantage of their chances when they are teeing it up on the North. Woods will play the South course on the first day, and then over to the North on the second. Those who play the South course during the first round usually do not find themselves among the top leaders at the day’s conclusion. But if they do, you know that they played an exceptional round. Last year’s Farmers Insurance Open ended in a playoff, with Snedeker defeating Kyle Stanley. Of course, most remember Stanley’s collapse on the 72nd hole, where he made a triple bogey to fall into a tie with Snedeker. This should definitely be a great week for golf fans everywhere, with many eyes fixated on how Woods will play. This entry was posted in News and tagged brandt snedeker, dustin johnson, farmers insurance open, phil mickelson, the masters, tiger woods, torrey pines on January 23, 2013 by Bryan.